My kids are nine (almost 10!) and seven and prefer to ride their own bikes most of the time these days. They weight about 65 and 55 pounds so they’re still totable, but I’ll admit I’m happy not to be toting them. However, I still always bring my Big Dummy just in case. It’s great having a bike that can carry both kids and their bikes. 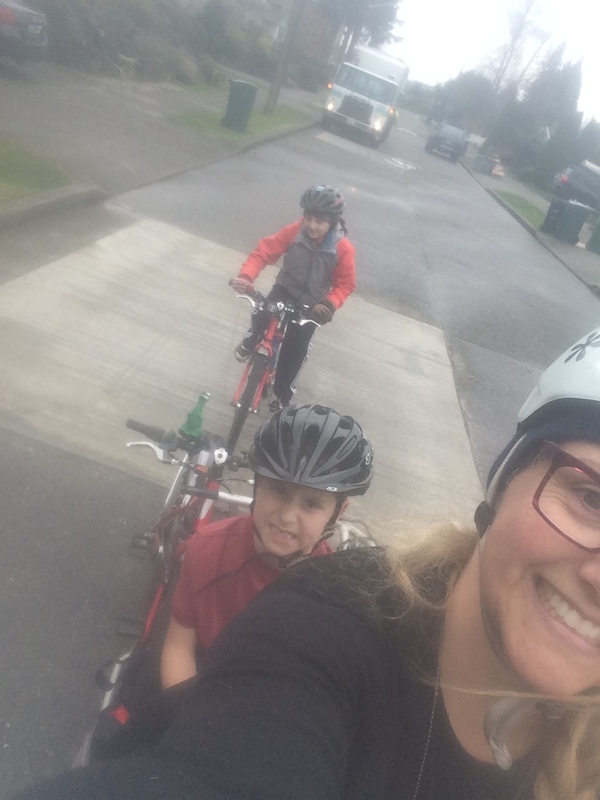 A year ago they were often tired and requested rides and I was quick to oblige because I’d hate to have them get grumpy about biking for transportation. And it seems to have paid off! They’re still happy to bike everywhere and only turn into passengers in case of injury. My nine-year old usually walks up the last uphill block home from the trail and is happy to push his bike…but I’d feel obligated to carry him up if he ever thought to ask. The last hill is always the worst hill, right? But! Bike parking is very important. 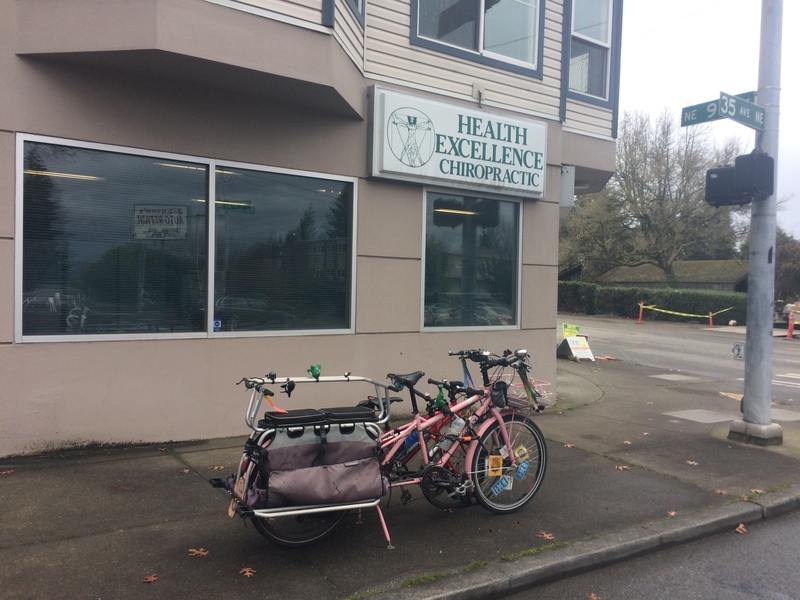 Three bikes is a lot to park even with a bike rack, but there’s no rack near the chiropractor so my 80-pound cargo bike with super sturdy Rolling Jackass centerstand isn’t going to tip over or get carried away so it’s a great bike rack. And today I was lucky (?) and my bike got a job after all! As I was thinking about the whole bike-as-bike-rack thing, my seven-year old crashed. It was a pretty exciting crash–he was riding ahead of me up the 39th Ave NE greenway because speed humps are for bunny hopping at high speed. We caught up to the recycling truck and as I hollered, “Slow down! The truck is going to stop suddenly!” the truck stopped suddenly and my little guy slammed on his brakes and skidded out on the damp road. He didn’t come close to hitting the back of the truck, but he was flat on the ground and done riding for the moment. I knew this because he marched over to my bike and climbed onto the deck as I assured the recycling truck driver that he was fine and no, there was no need to call 911. So I got to carry him the last mile and a half uphill to the chiropractor. 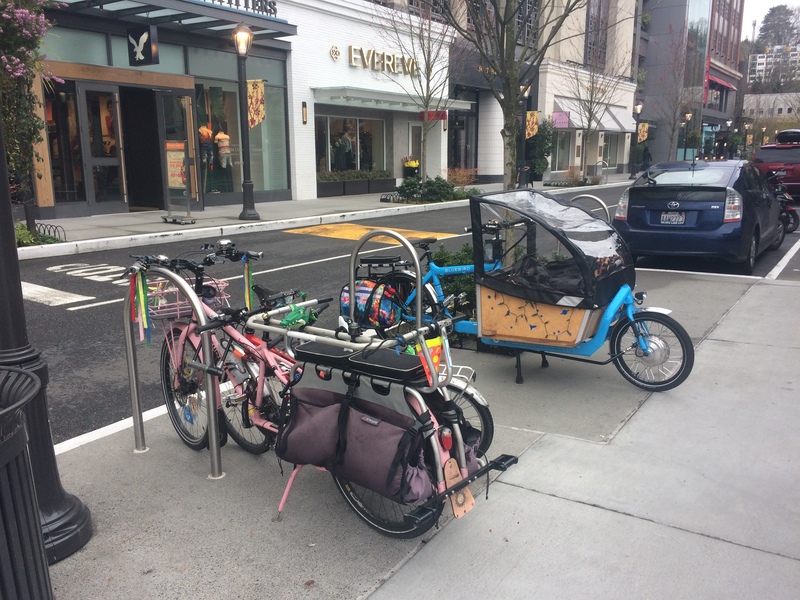 We still ride our tandem + trailer bike sometimes, but at the moment it seems to be more of a bike camping rig than an around town rig. The last time we took it out was for a less-than-one-mile trip to the grocery store, but on that day the nine-year old wanted to ride his own bike while the seven-year old wanted to ride the tandem with me so of course that all went horribly wrong and we’ll never take mismatched bikes again. I think we’d probably ride it a lot more if I didn’t need to carry it (it’s 57 pounds) up the flight of basement stairs to get it outside. But back to today’s trip, I want to mention that it worked so well on separate bikes thanks to some great bike infrastruture. 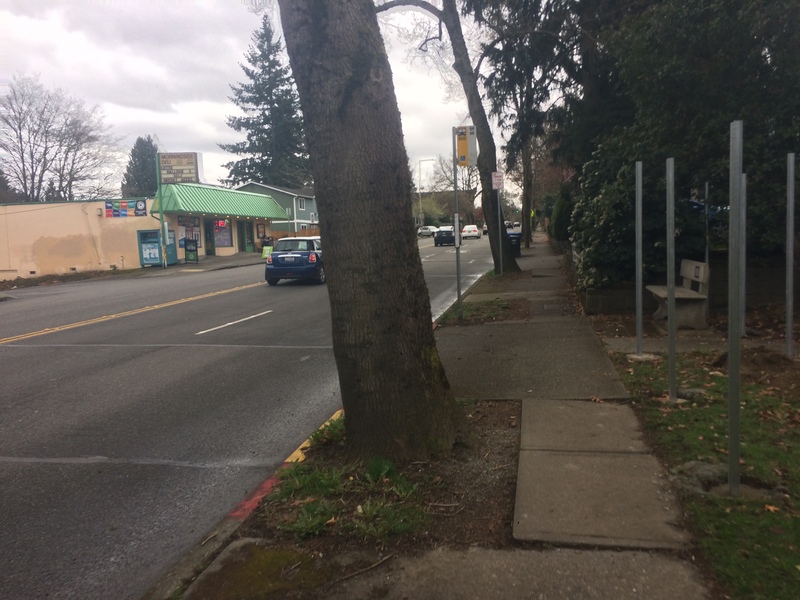 We live two blocks from the Burke-Gilman Trail–though we can’t head directly to the trail due to two busy street crossings and a too-steep (downhill) block. So we ride one block in a bike lane, jog a block on the sidewalk to the left to get to a crossing with stop signs (though one of two lanes in one direction doesn’t have a stop sign so I’d never let the kids cross there alone :/ ), and then one last block to the trail–but also on the sidewalk again because it’s too steep (downhill again) for the kids to be in the street lest they lose control. And then we wait (10 cars this time) for someone to stop and let us cross to the trail. 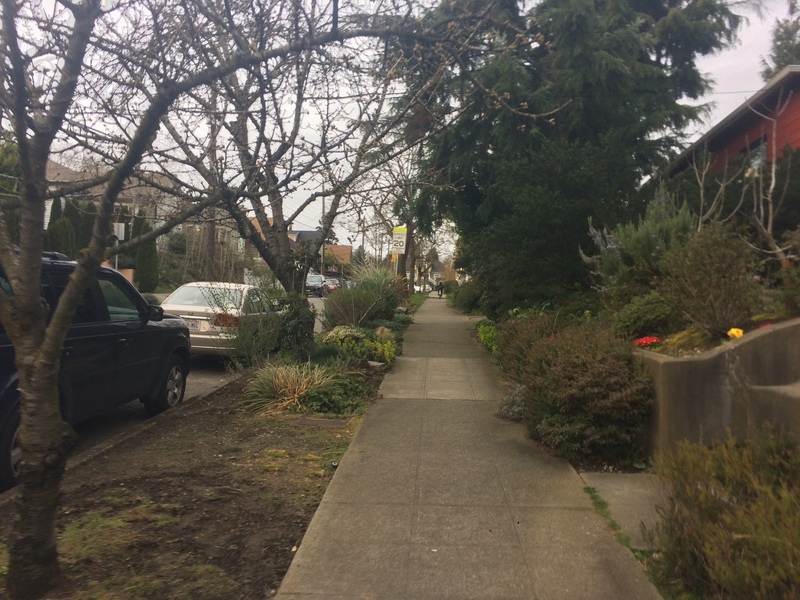 After three miles of trail we turn onto the 39th Avenue NE neighborhood greenway. That’s a lovely two-mile ride with a couple busy streets to cross, but totally safe for the kids to ride ahead of me between intersections. 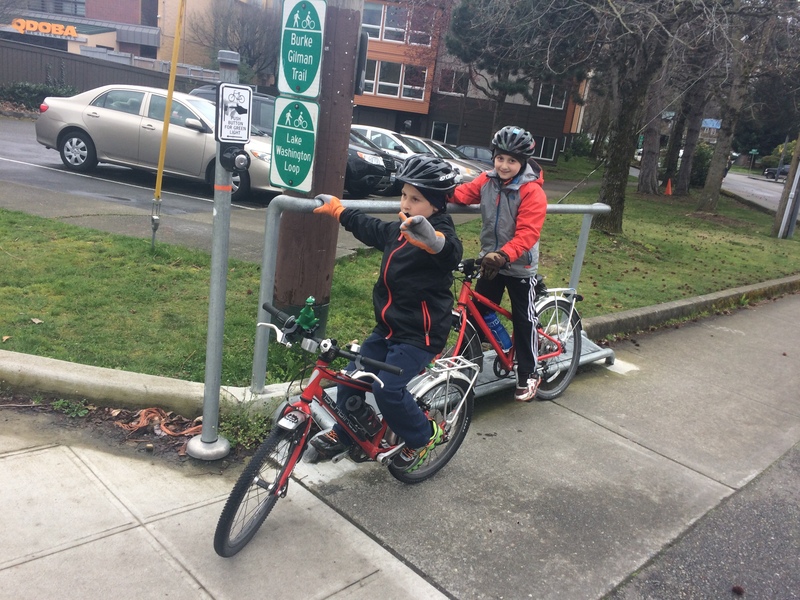 My seven-year old is starting to ride ahead through smaller intersections with my encouragement, but he tends to prefer to wait for me…or in some cases ride over the bike counter sensors seven times while he waits for me to catch up. We have to ride six blocks of sidewalk at the end which is a bit of a bummer after having so much great street and multi-use trail riding beforehand, but it’s pretty amazing that we can get all the way to Wedgwood on separate bikes! This particular sidewalk has lot of narrow spots and driveways obstructed by fences and hedges so we are very slow and cautious. We’re all well aware that the sidewalk can be more dangerous to bike on that the street. Heading home we stopped for happy hour at Blue C Sushi in U-Village. 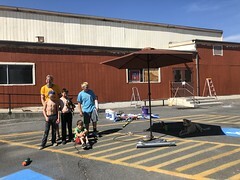 Parking lots are awfully dangerous to bike in, too, but we come here periodically so the kids are good at sticking near me and listening to me chatter about cars backing out of parking spots. My time-lapse video makes it look much scarier than it is. U-Village got rid of my favorite bike rack near the tiny play ground, but it has lots of staples all around. And we even ran into friends! Heading out of the shopping center on the west side has us on the sidewalk for one busy-street block and then for one quiet block because it’s too steep for us to be in the street. But then we’re back on the Burke-Gilman Trail! Perhaps someday they’ll add better bike routes into and out of the shopping center on both sides. It’s great having a place like this a tad less than two miles from home. 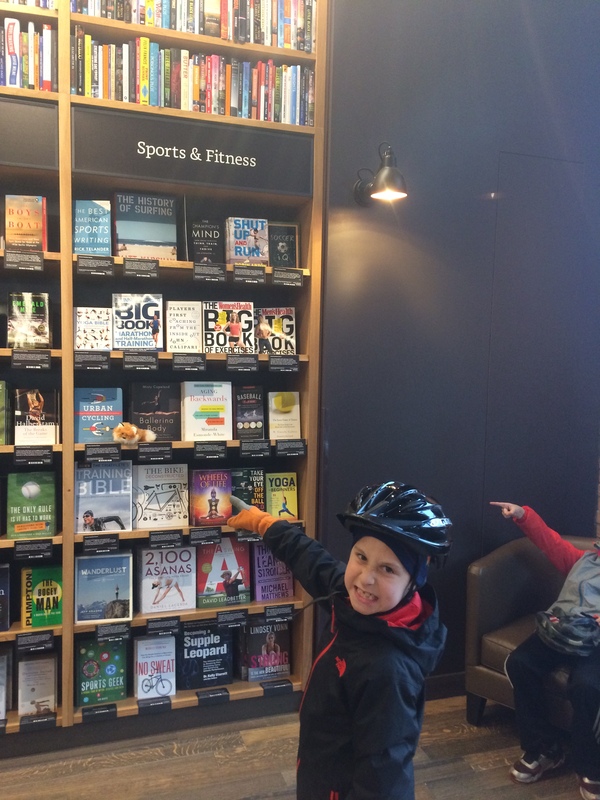 We usually only visit for sushi, but today we also popped into the Amazon Books physical store to look at my book–woo hoo! And buy a copy of Lost Seattle (in English) since the kids are enjoying the Spanish translation at school. U-Village also has ice cream, cupcakes, several Starbuckses, groceries, clothing stores, events, etc etc. 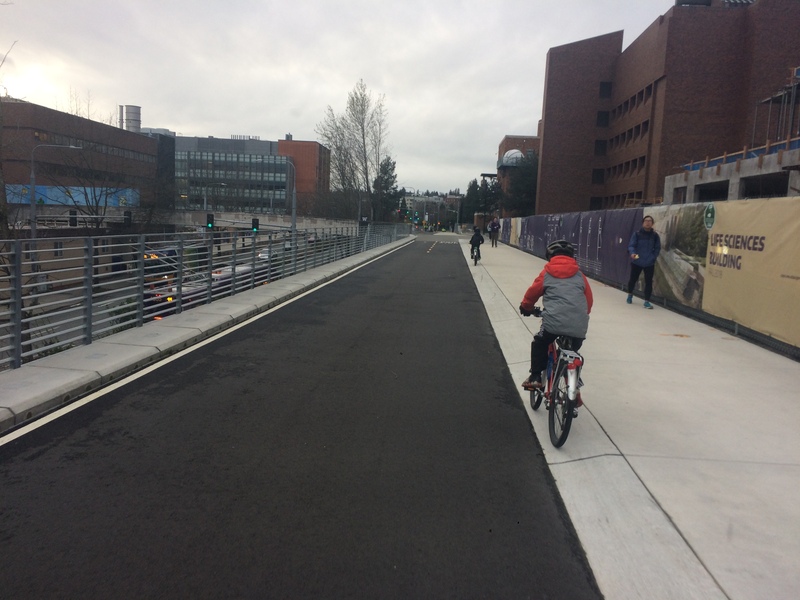 Westbound on the Burke-Gilman Trail is better than eastbound because the kids can ride the “velodrome” through UW–the little banked curb between the bike and ped sections. The Burke-Gilman Trail is mostly multi-use with just one big section, but these divided areas are nice. Heading home from the Burke-Gilman Trail is a bit of an adventure. It’s a shame we live two blocks (as the crow flies, not as the bike bikes) from such a gem, yet we have to deal with uncontrolled intersections and/or sidewalk riding to get to and from it. It’s too steep to return home the way we came so we leave the trail at “the crazy intersection of NE 40th/NE 40th/NE 40th/NE 40th/7th Ave NE/Burke-Gilman Trail (oh, Seattle, your street grid can be so silly)” in the crosswalks and it’s a bit scary. 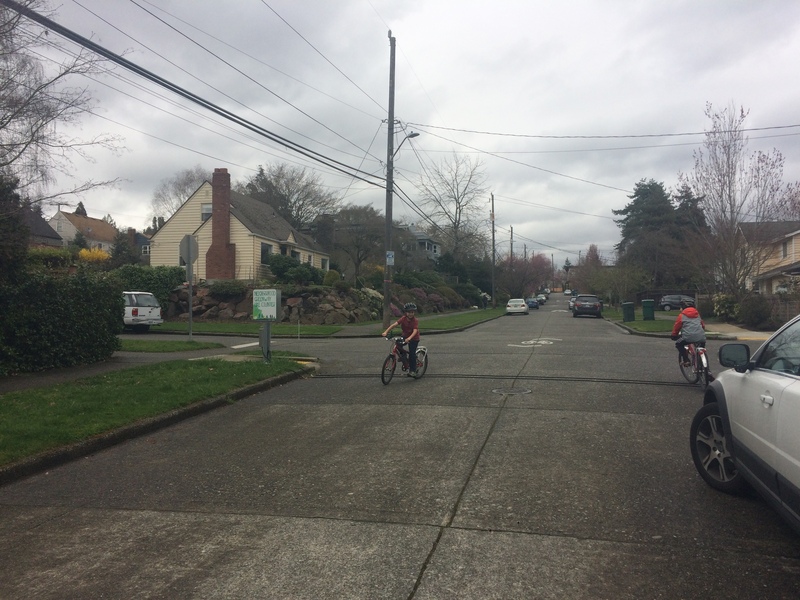 Then we ride a few blocks of the sidewalk of 40th because it’s too busy for the kids to be in the street and stay on the sidewalk of 4th as we bike by school. That’s both because there’s no curb cut to get to the street, but also because we get spread out on such a steep street. My seven-year old either waits on the sidewalk at the top of the hill or carefully rides the rest of the way home on the sidewalk. I wouldn’t mind him in the street, but he prefers the sidewalk when he’s ahead of me here. Then I wait for my nine-year old to walk up behind me and the two of us ride home in the street. I biked the slopey part today :P It’s fun even if you’re > 9! So glad that your boys are growing into such strong bikers. I wish we had more trails here in Baltimore. It’s no Portland here, that’s for sure, but we’ve got a lot! And I’m really lucky that the NE greenway went in right by our chiropractor I found eons ago when I had a car!